The FS50 Hall-effect sensors accurately track extremely small changes in magnetic flux density-changes generally too small to operate Hall-effect switches. As motion detectors, gear tooth sensors, and proximity detectors, they are magnetically driven mirrors of mechanical events. As sensitive monitors of electromagnets, they can effectively measure a system’s performance with negligible system loading while providing isolation from contaminated and electrically noisy environments. Each Hall-effect integrated circuit includes a Hall sensing element, linear amplifier, and emitter-follower output stage. 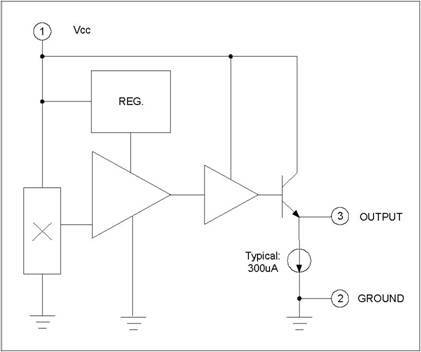 Problems associated with handling tiny analog signals are minimized by having the Hall cell and amplifier on a single chip.